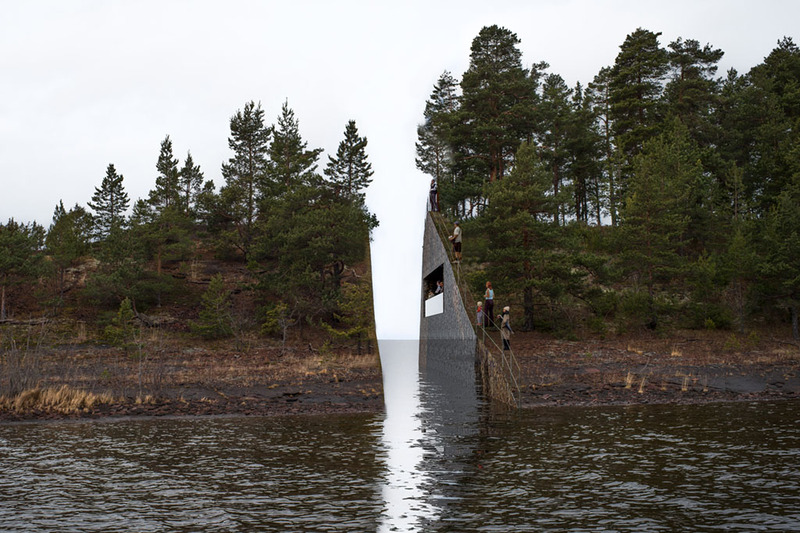 A “memory wound” was chosen this month by a Norwegian panel to memorialize the 2011 massacre of 77 people, most of them teenagers, by a political extremist. The winning entry in the July 22 Memorial design competition is by Swedish artist Jonas Dahlberg. 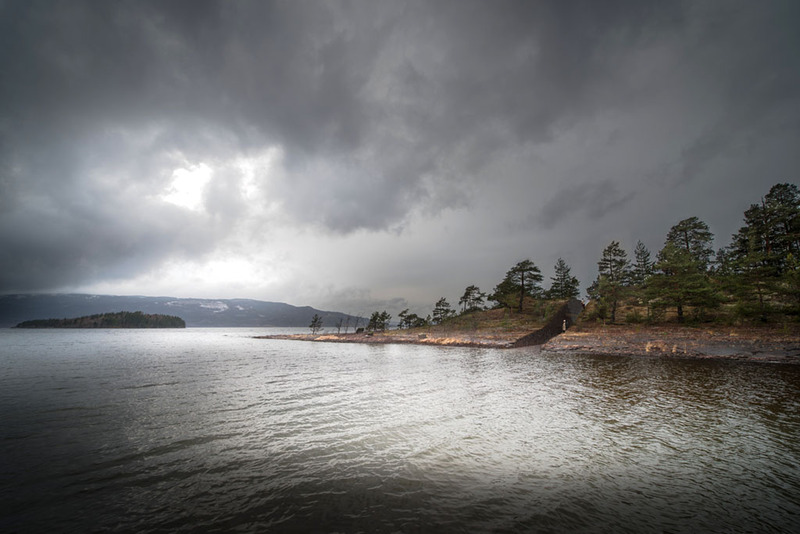 Its several parts are dominated by a void – literally, a slice to be removed from the island where Anders Behring Breivik slaughtered 69 children attending a political camp. The names of the dead will be engraved in the wall on one side of the channel, symbolically out of reach of those in the viewing area on the other side, pictured to the right. Dahlberg’s concept takes the site at Sørbråten as its point of departure. Here he proposes a wound or a cut within the landscape itself to recreate the physical experience of something being taken away, and to reflect the abrupt and permanent loss of those who died on Utøya. The cut will be a three-and-a-half-metre wide excavation running from the top of the headland at the Sørbråten site to below the waterline and extending to each side. This gap in the landscape will make it impossible to reach the end of the headland. Prior to his heavily-armed rampage on the island Breivik bombed government buildings in Oslo, killing eight. 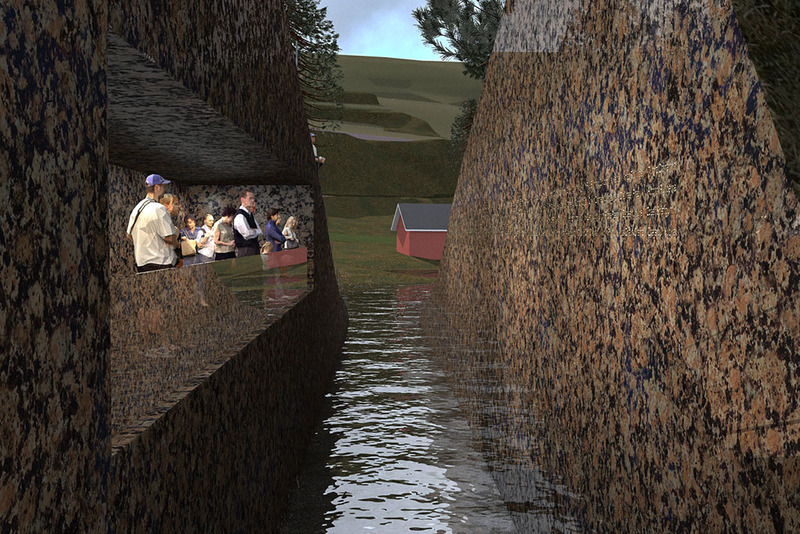 Dahlberg’s design calls for the material excavated from the cut at Sørbråten to be moved to Oslo, where it will eventually become part of a permanent memorial in the city. Jonas Dahlberg’s proposal takes the emptiness and traces of the tragic events of 22 July as its starting point. His suggestion for the Sørbråten site is to make a physical incision into the landscape, which can be seen as a symbolic wound. Part of the headland will be removed and visitors will not be able to touch the names of those killed, as these will be engraved into the wall on the other side of the slice out of nature. The void that is created evokes the sense of sudden loss combined with the long-term missing and remembrance of those who perished. Anders Behring Breivik was convicted in the Oslo District Court in 2012 of murdering 77 people and of terrorism. He was sentenced to 21 years in prison – a penalty which may result, under Norway’s system, in an eventual life sentence. There was conflicting testimony during his trial about his difficult upbringing, his mental health, his extremist opposition to Islam in Europe, and his extreme-right political views. Independent, non-partisan and employee-owned, F&O performs journalism for citizens, funded entirely by readers. We do not carry advertising or solicit donations from non-journalism foundations or causes. Sign up for email notices with the subscribe form on Frontlines, where we post small stories and announce new work. We offer site day passes for $1, and subscriptions at a modest price.